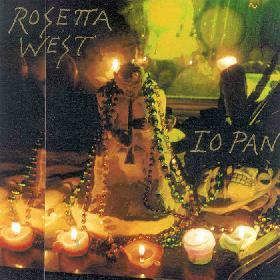 Rosetta West - "Io Pan"
Rosetta West is an Illinois band fronted by Joseph Demagore, who sings and plays all the guitars, keyboards flute and writes all the songs. This self produced home recording(?) is very raw and stoned. Stoned music for and by stoned people. The CD features 11 original numbers and a cover of a Yardbirds song. "My Life" starts the CD and is a mostly acoustic song. "Chain Smoke" is next and reminds me of Tom Waits and the lyrics are very interesting and there is a lot of weird stuff going on in the background. "Happenings" is next and a very very nice rendition of the Yardbirds number. "Puerto Rico" is a stoned rock instrumental. "Second Half Soul" is another stoned rambling instrumental tune that seems part of a bigger jam that was cut off around 2 minutes. "Nagooba" starts with some tribal drums and flute and then Joseph begins to sing and chant. "Blue Honey" is a very cool down south swamp blues boogie song. "Return to the King" is a spoken word piece devoted to IO Pan. "Morning Star" is an acoustic ballad with a very dark feeling. Diana and Rhianna continues in this dark, slightly eastern acoustic vein. The CD finishes with "Rain Man", a quite strange bass drone with the vocals and guitar sounding like they are in the other room and slowly they all come into the same place. Very stoned. Overall, a very cool collection of music. Joseph is making music from his heart for himself and hopes that you will listen and understand and enjoy his musical adventure to IO Pan. The CD is available for $10 from: Joseph Demagore; PO Box 807; Geneva, IL 60134.